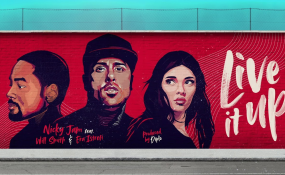 Will Smith has released the official World Cup song, Live It Up, alongside Nicky Jam and Era Istrefi. Johannesburg — Thursday May 24 was a special day for African football fans. It was a day Multichoice Africa chose to connect them with the events of the Russia 2018 World Cup clear two weeks before the competition's kick off.The event, aptly tagged 'Connect with Greatness, drew football aficionados from across the world to the Multichoice complex in Randburg and it turned out to be a befitting prelude to the World Cup. Laced with music and dance by Russian dancers, the event saw such football icons as Dwight Yorke, Mathew Booth, Lucas Radebe and officials of Multichoice taking the audience through what they should expect from SuperSport during the Mundial.Head of Production at SuperSport, Alvin Naicker, who said he has been working on the World Cup since 2002, led the journey through the expected offerings at the Russia 2018 World Cup. "We are happy that Nigeria qualified for the World Cup with a very formidable squad because we expect Africans to follow the Super Eagles throughout the games. "Egypt has Mo Salah, who is a huge attraction and hopefully he will lead the Pharaohs to a good outing in Russia. And then there are Cristiano Ronaldo and Lionel Messi who are huge draws to fans at major football events like the World Cup." Naicker revealed that SuperSport took time to plan its broadcast of the World Cup, adding that every detail had been considered in the preparation for the competition. "The World Cup is a massive production that we have put together in a brand new studio, which will make viewing a pleasure to the subscribers. But we are not a television station. We are a broadcast outfit feeding subscribers on different platforms with first hand information from Russia. "SuperSport has a production team in Russia helping the hosts to produce contents from the venues. "He revealed that apart from the match feeds, "SuperSport has planned eight other live feeds from the venues to bring to our audience behind the scene events in Russia. "We have reconstructed our studio six such that it now has seven segments that can broadcast simultaneously. Some of my colleagues around the world have been wanting to know how we were able to achieve this feat." He listed Dwight Yorke and Andy Townsend as among SuperSport's analysts during the World Cup, adding that they would also be part of the magazine programme, Masterplan. "Yaya Toure, Jay Jay Okocha, Gianluca Zola, Benni McCarthy, Pitso Matsuname, Mathew Booth and Lucas Radebe are also on the list. 'The Insight is a programme where we have an ex-footballer looking at events from across the venues and reactions across the world. This will be anchored by Phil Neville. We also have a studio for our Portuguese subscribers with Victor Baia as one of our anchors." He disclosed that all the 64 matches at the 2018 FIFA World Cup in Russia will be available live in HD to DStv and GOtv viewers, with viewers getting the best of expert commentary and analyses on six dedicated SuperSport channels.Naicker revealed that some other World Cup greats like Michael Owen, Pele, Sunday Oliseh and Sir Geoff Hurst are in the line up, going down memory lane to iconic World Cup moments that stood out for them. Also included in the campaign is Victor Moses, still paving his path to World Cup greatness with Nigeria. He disclosed that once all six stars were confirmed and appointments were made, shooting was scheduled to take just over a month, but ended up taking three months due to issues with Pele's health.Pele's shoot finally took place at his home in Rio de Janeiro where he walked in using a walking frame and asked everyone in the room how they liked his new boots, referring to the walking aid. He reiterated that all 64 matches will be broadcast live and in High Definition throughout sub-Saharan Africa and the adjacent islands, with insight and analysis provided by a panel of local and international footballing greats.Also speaking at the event, former Trinidad and Tobago Captain, Dwight Yorke assured the subscribers that they would be served an unforgettable experience during the World Cup, adding that the line up is such that would keep them tuned to their televisions always. He recalled his performance at the Germany 2006 World Cup and the fantastic moments he had outside the football pitch. "Playing in the World Cup for your country is the best you can ask for as a footballer. We had a fantastic time in Germany and I believe it was equally a fantastic time for my compatriots back home." Booth advised football fans going to Russia to take cognizance of the long distances between venues, adding, however, that most of the matches would hold in Western Russia, which would be less than five hours by air. "Living in Russia as a player and going there to watch the games are two different things. Russia has its dark side, but it is nothing to worry about. The racists are very much a minority no matter what the press say." On the possible winners of the World Cup, Booth described Argentina as a dark horse because it has quality players, adding, however that Germany is the team to beat. "England is too young and may not be up to the task," he added.Also predicting the possible winners of the Mundial, Yorke said Russia 2018 is Lionel Messi's last chance to win the World Cup "so I am picking Argentina as one of the challengers. But there is no doubt in my mind that you have to look at Germany and France as the favourites because of the quality of the players they have and their game as a team." We are happy that Nigeria qualified for the World Cup with a very formidable squad because we expect Africans to follow the Super Eagles throughout the games. Egypt has Mo Salah, who is a huge attraction and hopefully he will lead the Pharaohs to a good outing in Russia. And then there are Cristiano Ronaldo and Lionel Messi, who are huge draws to fans at major football events like the World Cup.